Hello, dear readers! You are now in the beautiful northwest Georgia mountains. We sit on 7-1/2 acres of land that is covered in oaks, maples, dogwood, hemlocks, mountain laurel, rhododendrons, and white pine. 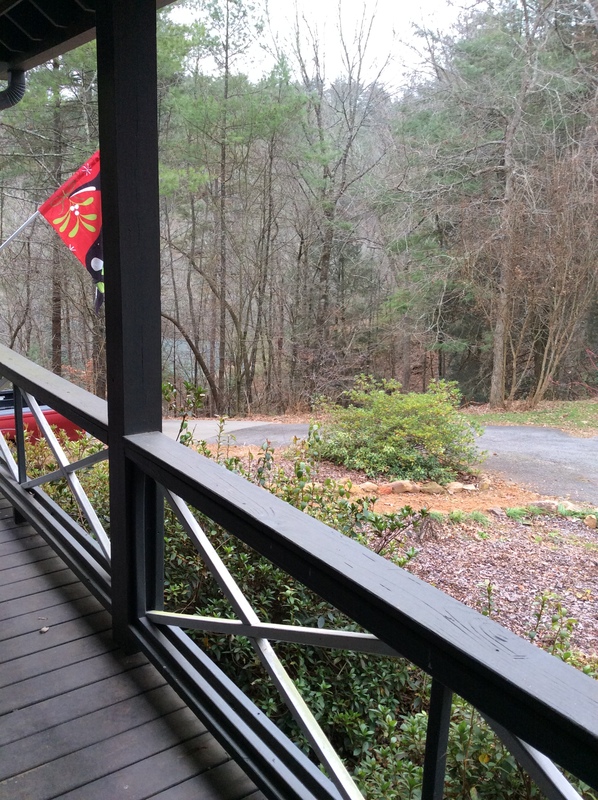 Our property is surrounded by the Chattahoochee National Forest. 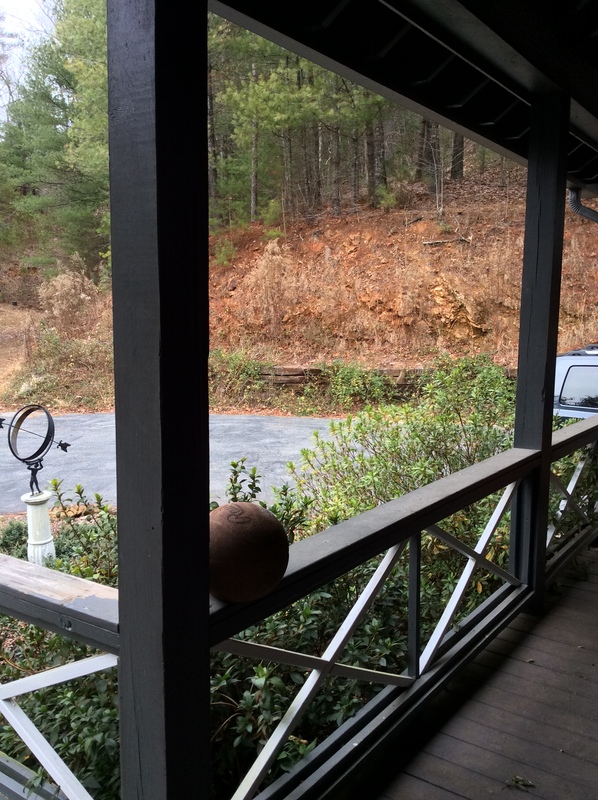 The picture below is a view from our front porch. Our closest neighbor’s roof, located way down the hill, is visible in the lower left corner of this shot; this is the only time of year we can ever see their house! I am a bit nervous about this post. To me, doing a tour of portions of the house seems akin to standing naked in a storefront window. However, I do want to welcome you into our mountain home. In fact, it would be so wonderful if you were all really here, so we could get acquainted (or in some cases reacquainted! ), share a nog and a toast, and then do a real walk-about. Mike came by around 2 pm to install the bar countertop & finish the woodwork. Oops! The countertop was cut too large (silver lining: better than too small? ), so he left immediately to take the top back to Charles (who assured me on Sunday, when I called him to ask where in the $@?! my bar top was, that he had the necessary dimensions) to be trimmed. 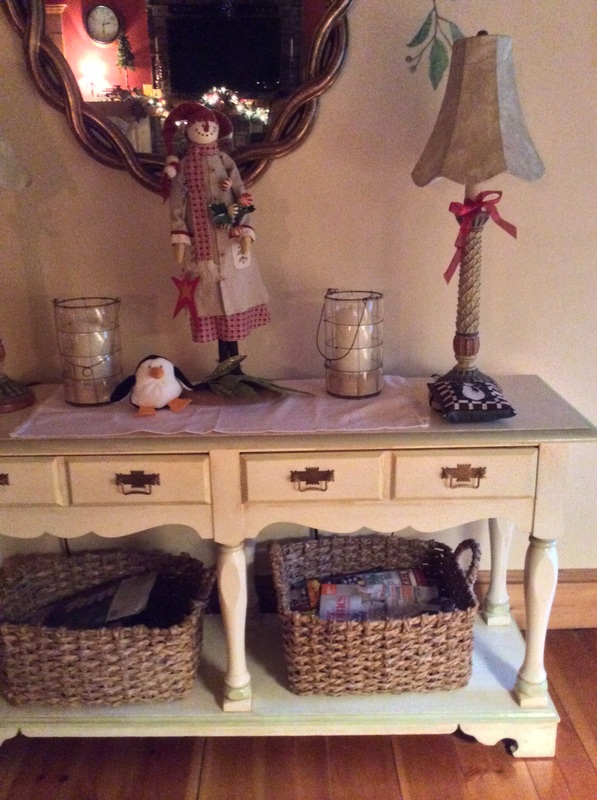 Good news…Greg picked up the additional glass shelves. It’s just one week until Christmas Day. It always seems like once Halloween goes, it’s Christmas. This year, that sentiment rings truer than ever, for me. My decorating process is usually leisurely and fluid. This year, it has been a whirlwind comprised of 50% inspiration, and the other half desperation! However, some things never change around here, and the 2 products that make Christmas possible at our house are Command Hooks, by 3M, and fishing line from Shakespeare (no, not the bard!). I bought a spool of that wonderful filament about 25 years ago, and finally had to buy a replacement this year. How else can you hang snowflakes from antlers, and have stars that just seem to be suspended in space? No other way that I can think of! Well, let’s start with the house entrance. It doesn’t look very impressive during the day (wires…yuck! ), but at night, it is quite lovely. The tomato cage trees are a new addition to our repertoire. I saw them on the “Simply Kierste” blog, and thought they were awesome. (Note: if you want to make these, be sure to buy the cages in the summer. Luckily, our Ace Hardware stocks them year ’round, but the usual suspects don’t.) 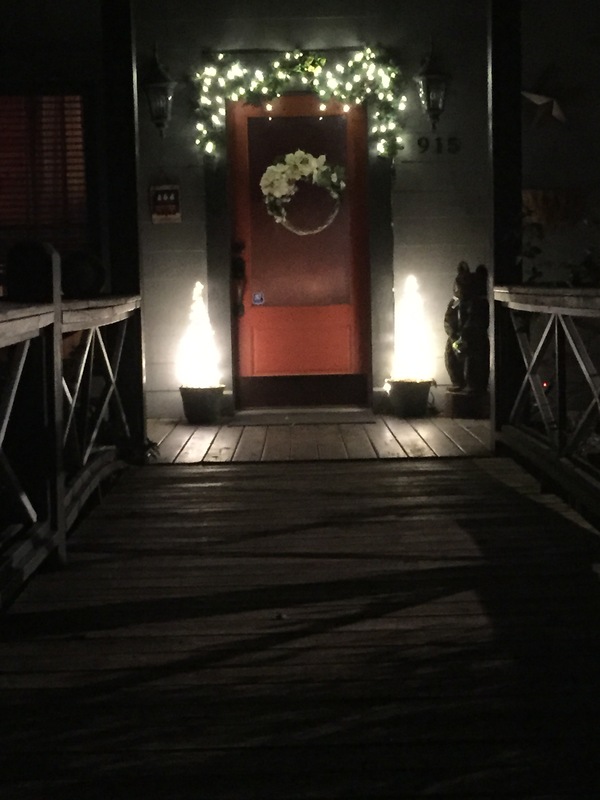 They were just the place to use our dainty little copper-wire strung Italian lights. The garland over the door sports the GE headlights 😄. Outside, their “whiteness” is much more acceptable than inside, on the tree. And then, of course, there is our carved Boo Bear. He was a Christmas present from Greg 3 years ago, and he NEVER fails to make me smile. 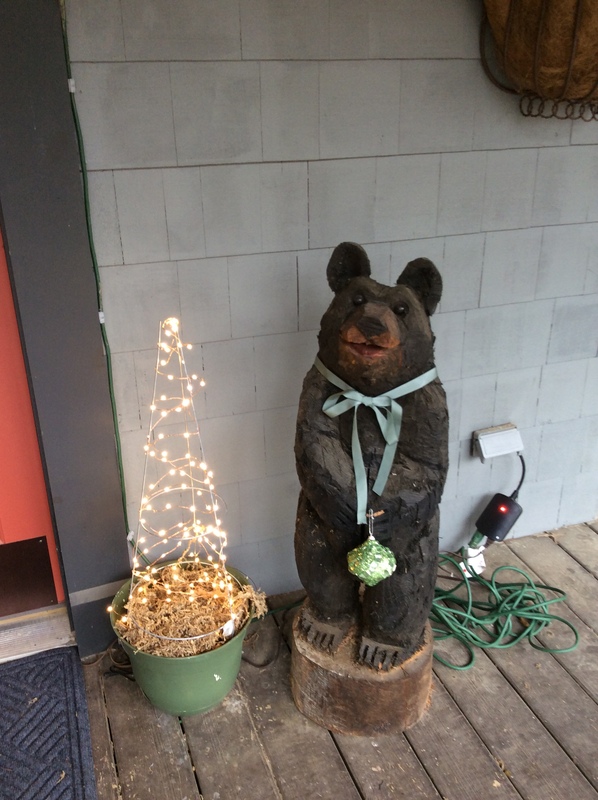 Those of you who are new to this blog will note the irony of “no moose or bear this home shall wear”. Turns out, we’ve got lots of bears, but no moose yet. I say yet, because I’m sort of warming up to them, but never on decorative items, like towels, bedspreads, curtains, toilet paper holders, etc. Back to Boo. He’s a little down this year, because he’s unable to sport his Santa hat this year. Why? Because the real Bear will eat it, just like he destroyed the WELCOME mat & Boo’s Halloween mask. Therefore, we gave him a less flamboyant look, so as to not attract undue attention from you-know-who. That jolly item parked on the railing is a half-inflated Rawlings basketball that he found in the adjacent garbage dump! Last night, he managed to bring it into the living room, but we feared for our lives (and that of our Christmas tree! ), each time he grabbed it in his jaws, and started to violently swing it back and forth. Greg banished it to the front porch bannister. Festive, no? The foyer isn’t, but we pretend we have one by placing the loveseat so that it creates a “walking lane” into the living room. The table under the mirror in the entry is the same one referenced in a prior blog; its laminate top was ironed off; it was painted; I still love it! 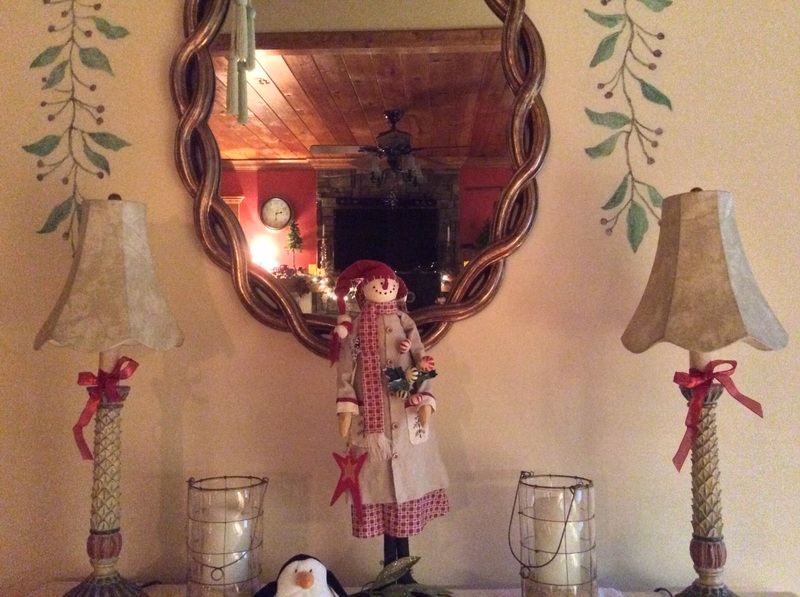 It showcases one of favorite things, a primitive snow lady, purchased as a gift from my sister our first Christmas in this house. She said my snow person collection needed it. She was so right. Thanks, FS! The vines around the mirror were hand painted by yours truly. I like them so much, when I changed wall paint colors, instead of obliterating them, I painstakingly painted around every leaf, stem, & berry with the new Inviting Ivory color! So glad I did…it makes the mirror look larger & gives it a stronger presence on that tall wall. The entryway was totally devoid of any lighting when we moved in. The previous owners had a ceiling fan, but we wanted something with more drama. Inspiration hit as we were driving through town one day, and passed an antique store that had a gorgeous antler chandelier in the front window, handmade by a local taxidermist. After much coaxing, Greg went in to ask the price: over $4000! Very much worth it, but not in my budgetary range. 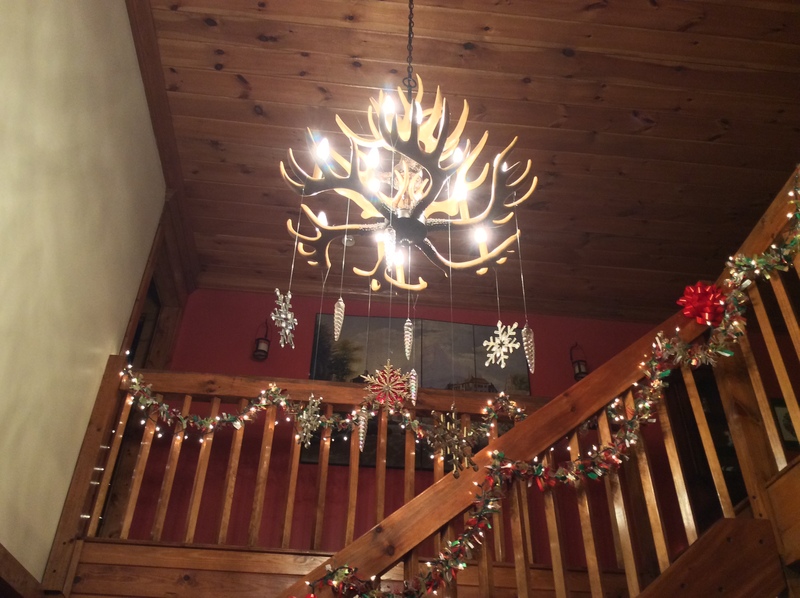 Undeterred, I googled “fake deer antler chandeliers”. I found this one on Amazon, supplied by a company called Kotulas. Since it is mounted so high, it’s difficult to distinguish it from the real deal. 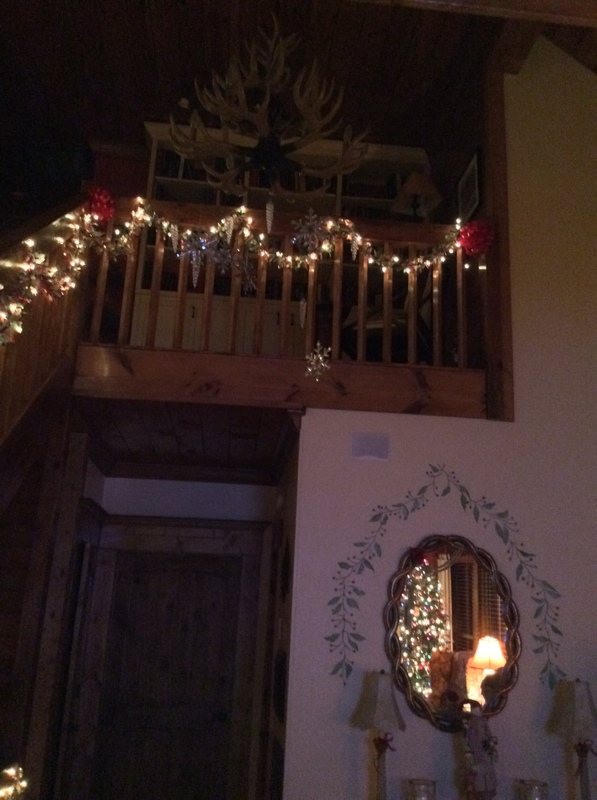 It was very affordable, and seems to be the perfect place to hang snowflakes from fishing line! 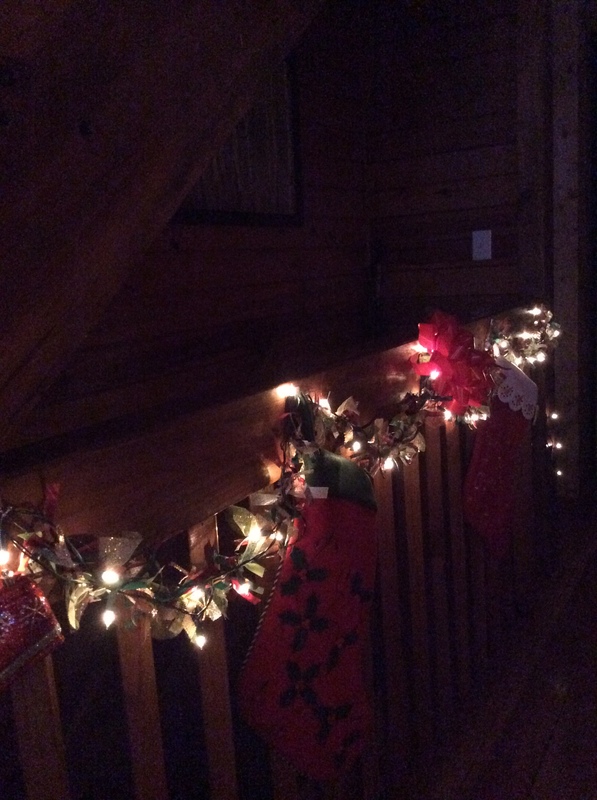 The garland on the bannister was constructed using strips of ribbon, burlap, and glittered mesh, tied onto kitchen twine. Midstream, I became very dubious about the merit of this project. It was very time consuming, and a supposedly low-budget decoration turned into a ribbon-fest (requiring trips to 3 different Walmarts, as I depleted the stock of “good” [i.e. budget] ribbon in one store, then moved onto the next!). Well, 1252 words later, and you have just barely stuck a big toe into the house. I think your ears need a rest, as do my typing fingers! Next installment will feature the living room, breakfast room, kitchen, & dining room. 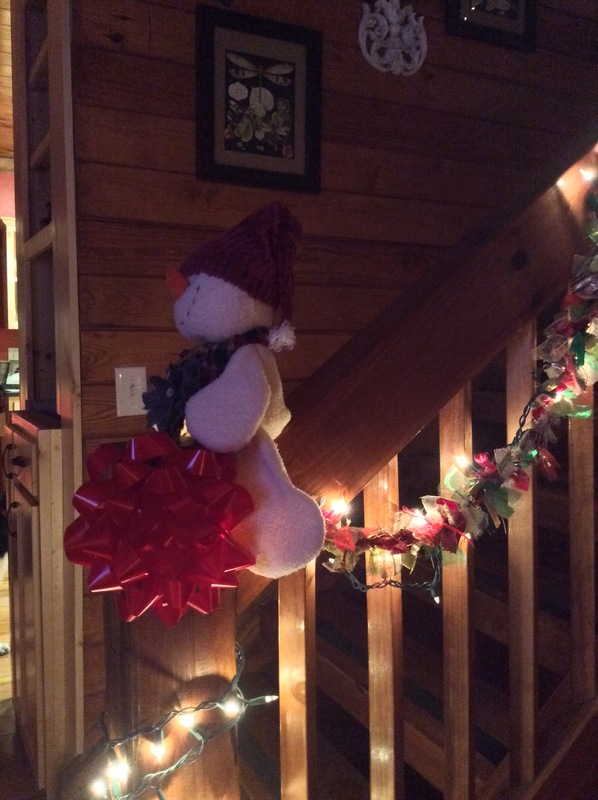 This entry was posted in Christmas lights, decorating the tree, Uncategorized and tagged Chattahoochee National Forest, glass shelves. Bookmark the permalink. What an amazing home you have! You’re so lucky to live on several acres with all those trees. I love the color of your front door and the banister is gorgeous! And I know what you mean about sharing photos of your home to the world and it feeling like standing naked! LOL. I’ll never forget how nervous I felt the first time I shared photos of our home on the blog. Eventually it gets less nerve-wracking. You are so kind. I love your blog, and am so happy you are visiting mine! I seriously need to improve the quality of my pictures; that will my #1 goal for the next post! 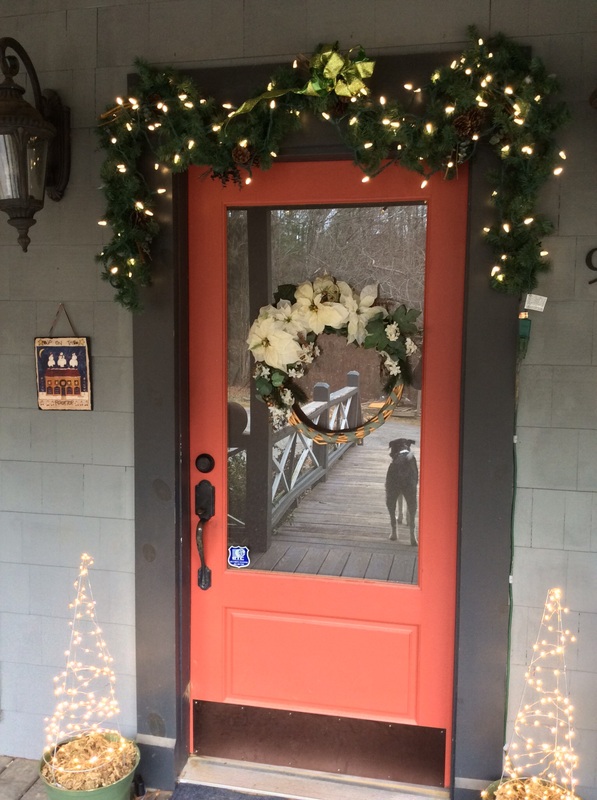 Wishing you and yours the merriest of Christmases & a happy, healthy & prosperous 2015.